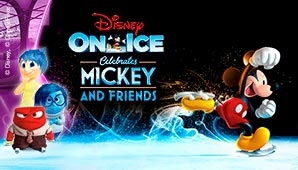 Grab your mouse ears and get ready for the ultimate interactive event at Disney On Ice celebrates Mickey and Friends. For the first time ever, see fearless Moana on a high-seas adventure with demigod Maui. Follow the unforgettable Dory through the unexplored seas of the Pacific Ocean, join the Toy Story pals on an exciting adventure and discover true love with Elsa and Anna.